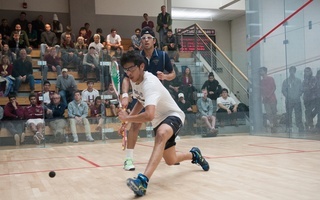 Down 4-3, playing side-by-side in tight matches, co-captain Bryan Koh and freshman Timmy Brownell held the weight of the previously undefeated Harvard men’s squash team’s hopes on their shoulders. But remaining undefeated was not to be. With the first and second teams in the nation facing off against one another at the Murr Center on Wednesday, expectations of a hard-fought battle arose. The No. 1 Crimson (9-1, 5-0 Ivy League) and No. 2 Trinity (15-1, 6-0 NESCAC) delivered that much and more. In a 5-4 thriller where momentum swung back and forth between the two squads until the night’s the final contest, the Bantams came out the victors, handing Harvard its first loss of the season. Brownell’s bout against Trinity sophomore Michael Craig was a microcosm of the match as a whole. Leaving it all on the court, the rookie played with abandon, putting all of his effort in each and every point. Visibly exhausted by the fifth set, Brownell couldn’t eke out a victory, and his 11-7, 11-8, 4-11, 7-11, 9-11 result secured the Bantam’s match win. In the early goings, after the first wave of matches, it had seemed that the Crimson was on solid enough ground to secure the victory. Sitting on a hard-fought 2-0 lead against Trinity junior James Evans with the squad looking to build on its 3-1 lead, senior Dylan Murray had a great chance to heavily swing the match in Harvard’s favor. Instead, the contest slowly slipped away from the Crimson’s No. 8 player in a close defeat, 11-8, 11-8, 4-11, 3-11, 5-11. The fourth and fifth sets didn’t go without a fight, but a nagging leg injury seemingly took some of the spring out of Murray’s step as the match wore on. The middle of the ladder is where Harvard played its best. All competing at completely different points in the match, the trio of Koh, freshman Sean Hughes, junior David Ryan, continued their winning ways. At the fifth position, Ryan pushed the Bantam’s Tom De Mulder around the court throughout the match. Playing with much emotion and quickness, the Dublin, Ireland native fully controlled much of the gameplay. In the end, Ryan put away De Mulder in emphatic fashion, faking a forehand and hitting a behind the back roller to seal the deal on match point. While lacking the same dramatic flare, Hughes’ and co-captain Devin McLaughlin’s triumphs were just as important for the Crimson’s effort, as they helped the Crimson build its early lead in the contest. Koh completed his victory when the day’s final result was no longer in question, but he nevertheless toiled through much of his bout needing to win to keep Harvard’s hopes alive. The Singapore native dropped the first set but rallied for three consecutive wins. The top three positions on the ladder were not as fruitful for the Crimson, as tight losses became the norm for Harvard on the glass show court. Freshman Saadeldin Abouaish, junior Madhav Dhingra, and junior Bradley Smith all played individual games that required more than 11 points to win. But the group ultimately fell, 3-0, 3-0, and 3-1, respectively. With the victory, Trinity regained the perch atop college squash that it has owned for much of the past two decades, at least for the moment. In a little less than two weeks when the Crimson hosts the CSA National Team Championships, Harvard hopes to change that narrative. —Staff writer Jackson Reynolds can be reached at jackson.reynolds@thecrimson.com. In more ways than one, it was the perfect end to a perfect season for the No. 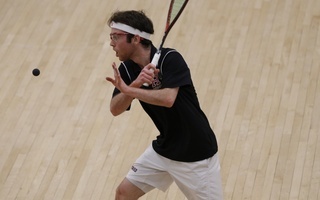 1 Harvard men’s squash team (18-0, 7-0 Ivy).